Cut-to-size label printing is a cost-effective way to highlight your product against the competition. Whether you’re planning to create mailing labels or food labels, your product should stand out up close and from afar. Your custom label design is an opportunity to either get your name out there or remind customers about your product. 2” x 3” and 3” x 4” - Normally used on food packages and jars with a length and width that can easily fit the product name but compact enough to be placed on small to medium sized items. 4” x 4” or 6” x 6” - Two sizes used for mailing address labels. Choose a size that matches your chosen shape and item. For instance, custom wine labels have a longer length but packages use wide address labels. We print both custom and die-cut labels on materials suited for indoor or outdoor use. 70 lb. label is recommended for products to be displayed in your store. 4 mil. white vinyl is durable and has a UV-resistant high gloss finish that makes the surface extra shiny and waterproof. High gloss UV coating can be applied on your 70 lb. label to give the label a pop of color. Matte provides a subdued and elegant finish on your custom label design. Gloss coating gives just the right shine while highlighting both the colors and images on your design. At 48HourPrint.com, you can order as little as 25 to as much as 100,000 labels and have them printed on after 1 business day. All custom size labels are boxed before shipment for safe keeping. Upload a ready-made design or use our online design tool to get started on your cut-to-size label printing. Does the turnaround time include the number of days for delivery? Printing turnaround is the number of days required to produce your order. Our shortest turnaround time takes one business day. It does not include shipping transit time, weekends, and holidays. The turnaround time starts once a print-ready file has been uploaded to a paid order. If you have requested a PDF or hard-copy proof, turnaround will begin once you have approved the PDF proof. To find out your order’s transit time, click on the “Estimate Delivery Time and Shipping Cost” link at the bottom of the online calculator. This will show your order’s expected delivery date based on your ZIP code. 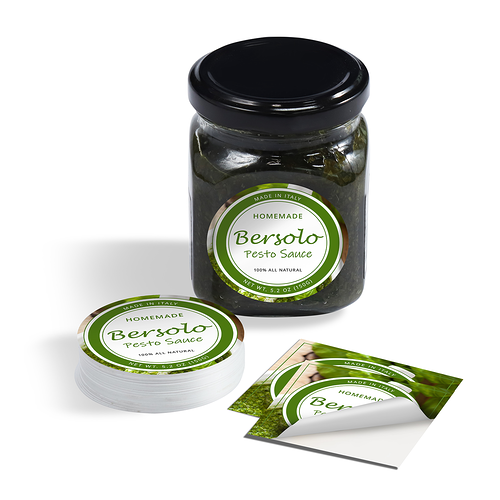 What is the advantage of applying rounded corners on my custom label design? Rounded corners give your label a look that’s softer and cleaner compared to the hard edges of a square shaped design. Rectangle labels with rounded corners are also less likely to flag, which means the edges don’t peel off as easily after application. What are the best uses for the label shapes available? Square and rectangle shapes are preferred for custom mailing and address labels. Circle and oval labels are normally applied on food product packaging such as bottles and jars to fit the item’s specific shape. But you can also use a rectangle or square shape on beer or wine bottles.